ProBite's lead free elbows can be used on copper, CPVC or PEX tubing and requires no special glues or plumbing tools to connect. 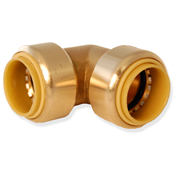 Our lead free elbow fittings take only seconds to install, offer full flow with no plastic inserts and can even be reused. Push Connect™ Elbow Drop Ear Push Connect™ Elbow Fitting 3/8" x 3/8" PC Elbow High Density, Lightweight Poly Tube Reamer, free-flo, Red 3/16"-1 1/2"
Elbow Drop Ear 1/2" x 1/2" FNPT Push Reducer 1/2" CTS x 3/8" 1/4" Turn Lead Free Push Connect™ Straight Ball Valve 1/2" x 1/4" OD.